heavy blacks here lends a somewhat stylized approach I find very appealing. In addition to the seemingly outrageous story hook, this issue also sees the return of Baron Strucker! In his debut outing, the character seemed strongly influenced by the "Baron" part of his name; he was first introduced at his home castle, idle and pampered, initially dismissing the idea of taking down Fury because he deemed the American unworthy of his time. And even when he was convinced - well, ordered - to do so, he didn't come across as much more than an arrogant, aristocratic weapons master. Here, on the other hand, he's presented as a dangerous and high-ranking officer in the Nazi regime, and the character is all the better for it. 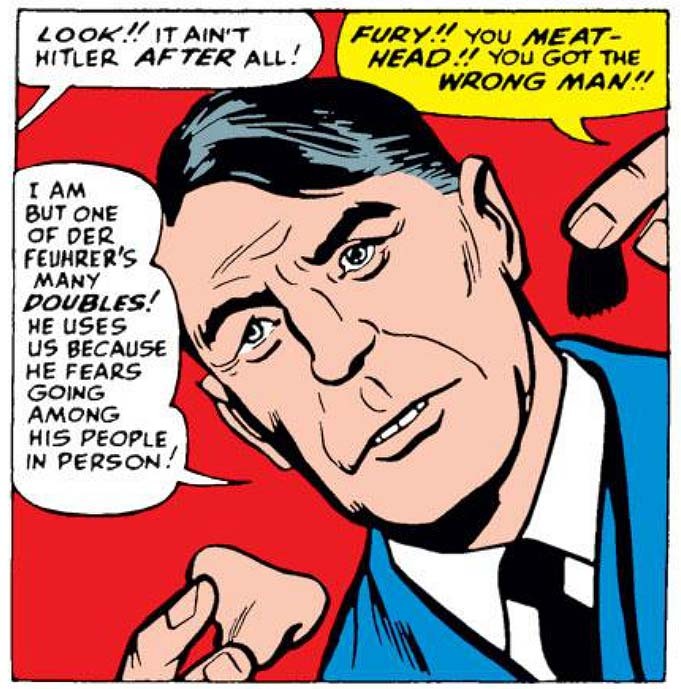 After all, for the many reasons cited above, Hitler himself can't really be an effective or believable recurring villain for Fury and his Howlers - but the Baron can, and that really begins now. These "translation" arrows are hokey as all get-out. I'm not sure we'll ever see them again. With a premise as provocative of this, you could be forgiven for wondering how Lee & Ayers could credibly pull it off! And the answer is ... well, they can't, really. Not credibly. Even the "plan" is jaw-droppingly naive, as it consists of no more than parachuting the Howling Commandos into Germany, having them attend one of Hitler's crowded rallies, and hoping they can somehow capture him there. In front of hundreds upon hundreds of supporters? And then get away without being seen? It's little wonder that a fight breaks out around them before they've even approached the Führer in question! 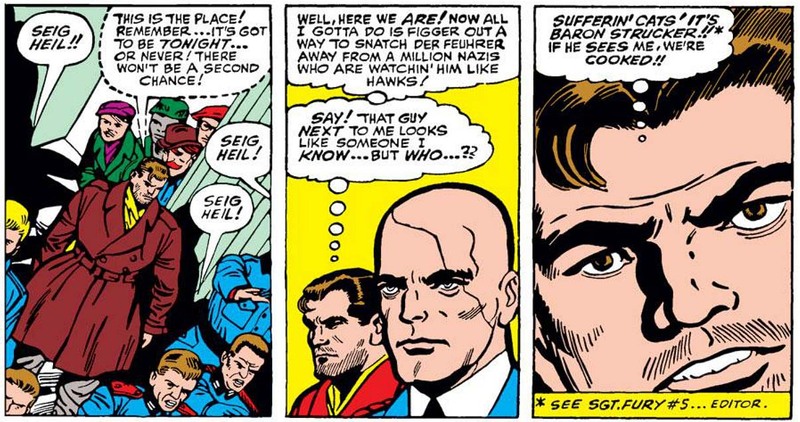 Before too long, any remaining credibility flies straight out the window when a disguised Fury captures Baron Strucker, forces him at gunpoint to convince Hitler to attend the public execution of the captured Commandos in person, and then chauffeurs the pair of them to the site. (!!) There are countless times over the course of this increasingly ludicrous story when the reader is forced to wonder why Fury might not take down Adolf himself when in such close proximity, or why Strucker wouldn't turn the tables on Fury when the sergeant is occupied with such distracting business as, oh, say, driving the villains around town. The situation is becoming frankly untenable. 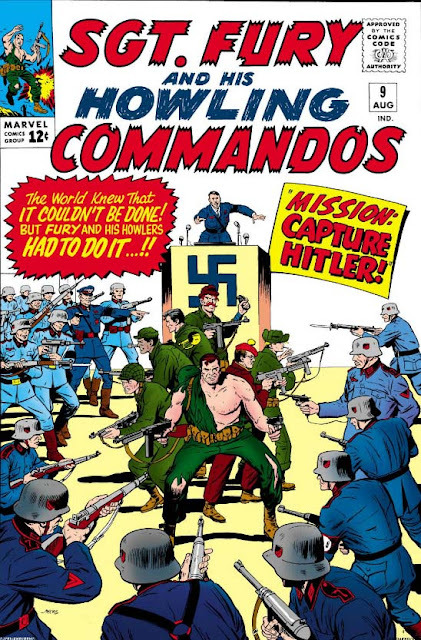 And yet, readers must have been shocked upon nearing the end of the tale to find that, against all odds, Fury's Commandos seem to actually capture Adolf Hitler after all, triumphantly whisking the dictator back to their Allied base! It's at this point, however, that their notorious prisoner removes his fake nose and moustache, revealing himself to be but one of Hitler's many doubles, used for the Nazi commander's various public appearances. While based in fact, the concept of "Hitler doubles" has of course proven rife for use (and misuse, and overuse) in fiction ever since, even forming the basis for numerous myths and conspiracy theories of the "Elvis is alive!" variety. Of course, recall that one of these potential doubles had already been seen some months before...! Well, I guess we can be thankful it wasn't a lifelike rubber mask!